Grameenphone Ltd. is the largest mobile telecommunications operator in Bangladesh in terms of revenue, coverage and subscriber base. The company was incorporated on 10 October 1996 as a private limited company. Grameenphone converted to a public limited company on 25 June 2007. The company became stock listed and started its trading at Dhaka and Chittagong Stock Exchanges from 16 November 2009. 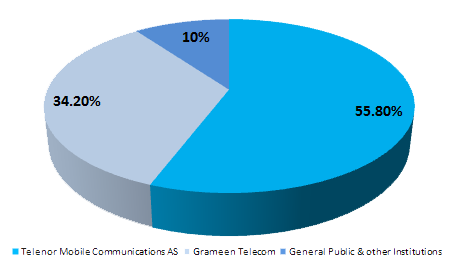 The shareholding structure comprises of mainly two sponsor Shareholders namely Telenor Mobile Communications AS (55.80%) and Grameen Telecom (34.20%). The rest 10.00% shareholding includes General public & other Institutions. Grameenphone Ltd. serves both rural and urban customers across Bangladesh, where mobile telephony is a major driver of socioeconomic development. The company envisions to provide the power of digital communication, enabling everyone to improve their lives, build societies and secure a better future for all. The company also has always been a pioneer in introducing new products and services in the local telecom market. Grameenphone Ltd. built its network on a nationwide basis. As of December 2017, the company’s network covered more than 99% of Bangladesh’s population with 2G services and more than 92% population with high speed 3G network. The company was awarded with license of 4G/LTE cellular mobile phone services on 19 February 2018. Grameenphone Ltd. has so far invested more than BDT 313 billion to build the network infrastructure. It is one of the largest taxpayers in the country, having contributed more than BDT 585 billion in direct and indirect taxes to the Government Exchequer since inception. TMC is an indirectly wholly-owned subsidiary of Telenor ASA. Telenor ASA is the leading Telecommunications Company of Norway listed on the Oslo Stock Exchange. TMC owns 55.80% shares of Grameenphone Ltd. Telenor was founded in 1855 and builds on over a 160 years of telecom experience from Norway. Through international expansion, Telenor today has mobile operations with solid market positions in Scandinavia, Central and Eastern Europe and Asia. Telenor had, as of 31 December 2017, 178 million mobile subscribers across its footprint, as well as 2 million fixed broadband and 2 million TV customers in Scandinavia. In addition to Norway and Bangladesh, Telenor owns mobile telephony companies in Sweden, Denmark, Hungary, Serbia, Montenegro, Bulgaria, Thailand, Malaysia, Pakistan and Myanmar. Telenor uses the expertise it has gained at its home and international markets for the development of emerging markets like Bangladesh. As part of the conversion of Grameenphone from a private limited to a public limited company, Telenor Mobile Communications AS transferred ten (10) shares each on 31 May 2007 to its three (3) affiliate organisations, namely Nye Telenor Mobile Communications II AS, Norway; Telenor Asia Pte. Ltd., Singapore; and Nye Telenor Mobile Communications III AS, Norway. Grameen Telecom, which owns 34.20% of the shares of Grameenphone Ltd., is a not-for-profit company in Bangladesh established by Professor Muhammad Yunus, winner of the Nobel Peace Prize 2006. GTC’s mandate is to provide easy access to GSM cellular services in rural Bangladesh and create new opportunities for income generation through self-employment by providing villagers, mostly the poor rural women, with access to modern information and communication-based technologies. Grameen Telecom, with its field network, administers the Village Phone Program, through which Grameenphone provides its services to the fast growing rural customers. Grameen Telecom trains the operators and handles all service-related issues. GTC has been acclaimed for its innovative Village Phone Program. GTC and its Chairman, Nobel Peace Prize laureate, Professor Muhammad Yunus have received several awards which include; First ITU World Information Society Award in 2005; Petersburg Prize for Use of the IT to improve Poor People’s Lives” in 2004; GSM Association Award for “GSM in Community Service” in 2000. As part of the conversion of Grameenphone from a private limited to a public limited company, Grameen Telecom transferred one (1) share each on 31 May 2007 to Grameen Kalyan and Grameen Shakti.